USE THIS VISUAL FOR PUTTING UP YOUR SVW. Each “sheet” that you see on this master copy is an 8.5 X 11 sheet. The display is massive, but it allows you to move through the time zones. 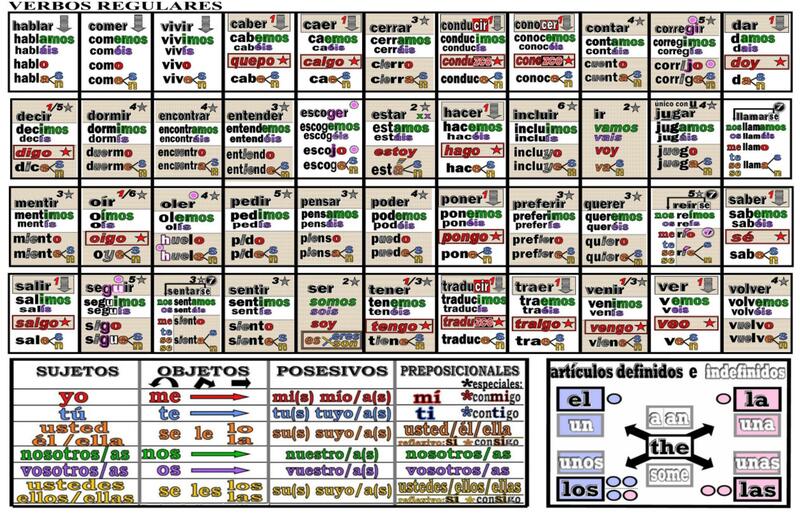 I recently went on YOUTUBE and saw many of my Spanish Verb Walls up in classes. I was so hurt and disappointed by what I saw. I was almost in tears. I worked so many years perfecting this project. Many were put up wrong. Other people sort of copied the idea, but missed many major ideas of the symbols. There are a couple of things that have been changed since that student master was designed and placed in this program. Unfortunately, when my computer was “updated,” it lost the program in which I made that master, but the changes are just little details. Some of the pronoun visuals have been rearranged slightly, combining some in order to save space. It will be quite obvious if and when you get you SVW kit. When I made the original layout, I wanted to merge the endings up to the common part. For example, I saw no need to repeat –aba/-ía over and over. So they are simplified. The visual message is: -aba is for everyone; for tú we simply add –s; for nosotros, -mos, for vosotros, -is and for ellos –n. In this version, I used the red and orange STOP SIGNS. In the version that you will put up, I changed the symbol to a straight line. It will make sense when you see it. Unlike the other lessons, I cannot post the VERB WALLS on the TeachersPayTeachers website. I cannot just give you the masters to copy. I must personally supervise and control the quality of the color printing. I can no longer afford nice, fast copy machines, so I must use an office printer. The printing and the colors are great, but it takes a LONG time to copy a kit. Also, in order to maintain the correct colors, I have to purchase the very expensive toner. The four colors cost me $350. I have tried the cheaper brand, and it was just awful. I cannot sell such an inferior product. I can only get a few copies from those cartridges. Maybe 8-10 at the most!! I formerly allowed some teachers to make their own copies, and they were terrible. You can order it with a Purchase Order from your school. I no longer use faxing because it is just easier to receive the orders by e-mail or old style mail. If you need to pay with a credit card, I am arranging with PayPal for you to pay there. If you are an individual in Texas, not a school, you need to add 8% sales tax. Texas does not charge sales tax on out-of-state sales. 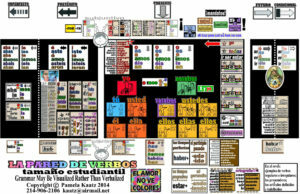 The kit includes all things you see on the Verb Wall layout side of the print master copy. 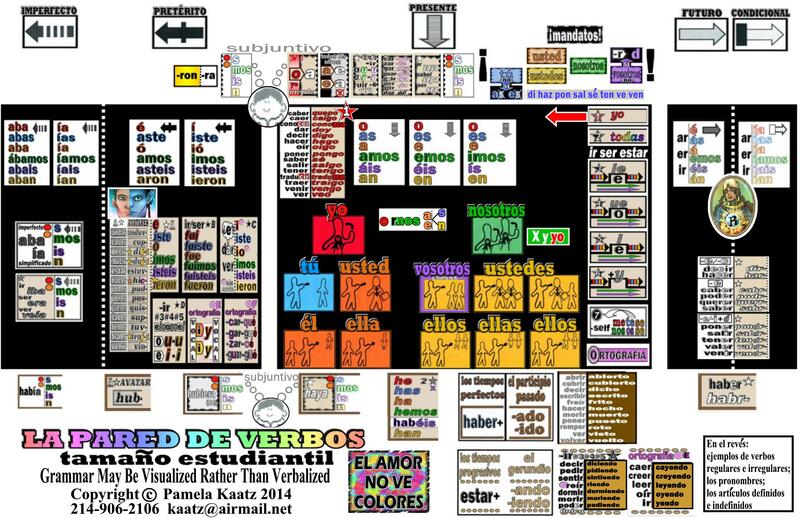 You will not receive paper copies of the verb examples on the back side side of the 11×17 master, but you will receive a DVD with all of them in PowerPoint programs. And a HUGE amount of lessons, materials you may copy, everything that is on the TpT website and much more. I want to be able to provide webinars in the near future. This may be hard since I am so techno-challenged. Whatever, I hope to be able to continue supplying language teachers these materials that help you visualize language patterns. Remember, we use these symbols and visuals to create PATTERNS, not memorize for rote recitation!! Read the lessons about things like Building Artificial Realities. 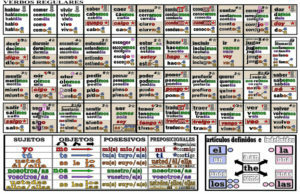 The object is to NEVER, EVER present the verb forms before communicating. The map is there for you so that you can move freely through all the possible ways to think. You can even work in experiences with the subjunctives. Friday night… football… Espero que ganemos. Other things come up and you simply go ahead and say them. We did a song by Justo Lamas… He sings…. Siempre por siempre te serás mi amor. Qué haceremos el viernes? I praised him for his effort to express something in the future. We walked over to the map, into the future and I simply pointed at the list of irregulars. Oh, he apologized… Qué haremos? NO need to apologize…I told him that he had made a fabulous attempt, and I was so proud of him!! If you get the “life size” Verb Wall take your time. Look through the lessons on the DVD, and it will all make sense. If this seems overwhelming, call me, and I will go over it some more with you personally. I’m retired, love teaching and want to help.